Philip Klaus’ memoir, “Blood Ties” is a heart-warming, gut-wrenching read about being adopted into a loving family, but never having the sense of who he is. Always curious as to how he fits into the world and why he does some of the things he does, puts him on the path to search for his biological parents. Having worked with children and adults who are adopted, there are so many questions left unanswered. Many concern themselves with, “Did my parents ever think about me or search for me?” Adoptive parents are concerned about health or mental health issues that might impact behaviors or a medical crisis. I found the author’s passion and vivid descriptions made me feel like I was on the journey with him. Frustration hit when one family member wouldn’t accept his intrusion and wanted to keep him a secret from his biological mother. When extended family members were found, I can honestly say I was ecstatic, scared, and curious as to what would happen. I felt every emotion possible during this read. Klaus' memoir isn't one to make readers feel sorry for him, but hopefully, provides encouragement in the steps he took to find his parent(s). The author includes pictures, letters to his birth mother, and letters from his dad to his brother. He also has a Facebook account where he gives suggestions to birth parents, adoptees, and adoptive parents, which I thought was very insightful and helpful. He does remind us that not all birth parents want to reconnect, nor does every reunion go well. 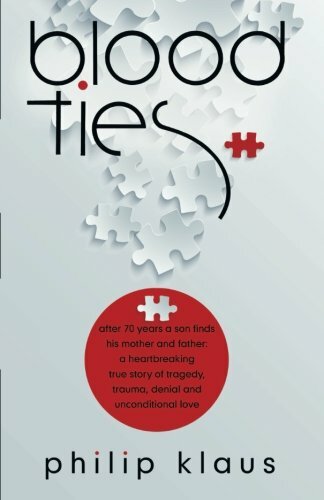 “Blood Ties” by Philip Klaus is a must read for all that have started a similar journey or those who have experienced it. The memoir provides insight into the thoughts of adoptees and birth parents and fears that many adoptive parents experience.